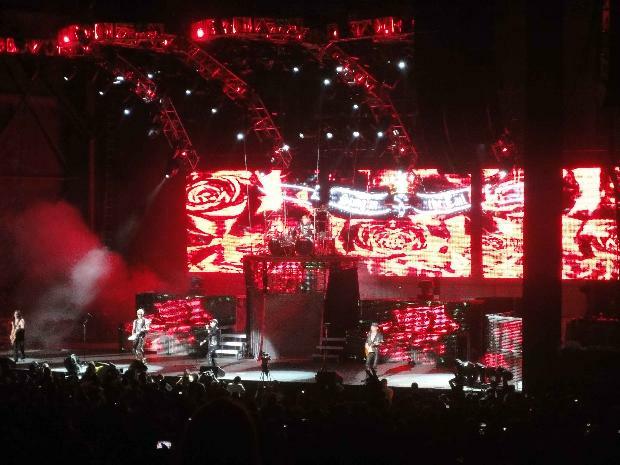 I was in town visiting my family and was able to catch the Scorpions concert with my sister's sons Corey and Scott. The Pavillion is an amazing new outdoor amphitheatre in Albuquerque. The layout is great and the sound and view as well. We have grass tickets but because Corey is in a wheelchair we ended up with a great place just in front of the grass area on the right but elevated above the walkway that separates the grass area from the seated area. Very good place. Tesla opened the show and the place was packed already and the crowd was really into it. The sun was setting behind the stage and it was really a beautiful, perfect night for a rock show. You could see the dormant volcanos silhouetted by the sunset. 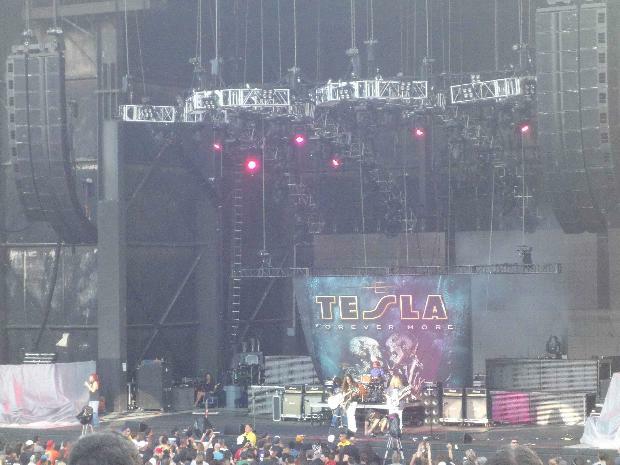 Tesla rocked pretty well. They seem to play a few more of their hit songs than at Sweden Rock a few years ago. I think their new songs are less mainstream and more hard rocking like 70s style with cool guitar solos, etc. They were good. I wore my Lovedrive 1979 t-shirt to this concert and I got a few looks and even attracted a poke from an old friend of mine who I had not seen in nearly 25 years, although we had recently been chatting on Facebook! Far out. It was great to see Wes after all these years. Anyway, Scorpions are quite different from when I saw them here in Albuquerque back in 1979 opening for Sammy Hagar and Pat Travers on Halloween! They had an amazing projection show with movies, etc to go along with their concert. It must get boring for them to do this same show to the same videos in the same order every nights for 2 years. Anyway, they were really into it and Klaus Meine still sounds great for a guy near or over 60, and Rudolph Schenker, the older brother of Michael, has the energy of a 25 year old as he runs all over the stage for the whole show. Besides Coast to Coast, Holiday and Loving you Sunday Morning, it was all 80s material. This is also what the USA audience is familiar with and the crowd was really loud and into it. I did see in Europe in March, the shows were longer and they still played some Uli era stuff like Pictured Life, He's a Woman She's a Man and We'll Burn the Sky, as well as more of their ballad songs. I had a good time and enjoyed the show. Fun to see them one last time.